Sony Discontinues PlayStation 3 in Japan, India to Follow? Australia is headed for a severe ‘flu season with doctors advising people take precautions to protect themselves from getting sick and spreading the virus. Experts are warning Australia is headed for a severe ‘flu season and say this may be due to delays with the roll-out of vaccines early in the season. Australia has had a 47 per cent increase in confirmed cases of influenza this year, with 11,000 cases already reported. Influenza consultant and chair of the Australian Influenza Specialist Group (ISG) Dr Alan Hampson says in an average year, we can expect about 10 per cent of the population will get the ‘flu but this year he expects that figure could rise to 15 per cent. “This year has all the hallmarks of a peak season, but there is still a window of opportunity for people to be vaccinated,” Hampson says. But doctors say it’s not too late to get an annual flu jab, even though we’re almost half-way through flu season. GP and deputy chair of ISG Dr Rod Pearce acknowledges the higher than usual ‘flu activity may be due to difficulty in accessing the vaccines earlier this year but stresses this is no longer an issue. “GPs do have [the vaccine] in their clinics and they are actively encouraging people to have their vaccine, because within ten days or two weeks, the vaccine will be effective,” he says. He says previous studies have shown the availability of the vaccine and a clinician to administer it greatly influences participation but concedes 3 to 5 per cent of people will never be vaccinated. Infection control expert at the University of NSW, Professor Mary-Louise McLaws, says it’s really difficult to avoid catching the ‘flu if you haven’t been vaccinated. “I would ask … do you have the ability to take a couple of days off work? If you don’t, get vaccinated because if you go to work, you will spread it because it’s very easily spread. “The ‘flu is transmitted by large and small particles. The large, or droplet-size, fall fast but the spread of ‘flu by small particles, after coughing and speaking, can spread up to 2.5 metres,” she says. Professor McLaws explains that an infected person could be sitting on the same bus or train as you and be spreading the ‘flu virus without any obvious sign, which is one of the reasons it’s so difficult to control. “You have to be very vigilant with your hand washing and coughing,” she says. So, washing your hands regularly gets rid of these germs before they can cause you any harm. Keeping your hands away from your face – especially your eyes and nose – also helps. McLaws’ own research has found humans touch their faces up to 23 times per hour, and on half of those occasions it involves the mouth, nose and eyes. Doctors are encouraging us to consider our families and work colleagues if we are feeling unwell with flu-like symptoms of fever and muscle aches. McLaws recommends self-isolation and the careful use and disposal of tissues together with vigilant hand washing, as soap and water do kill the virus, augmented by the use of alcohol-based hand rubs. 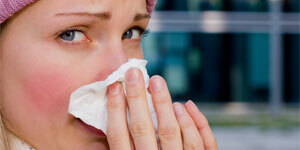 It’s estimated that each year flu is a factor in about 3,000 deaths. In terms of costs, Hampson says a conservative estimate of the cost to the healthcare system is about $85 million, but if you take into consideration the extended costs to industry and business, he argues the figure is much higher.